I'd like to talk the good, the bad, and the ugly regarding this game. Though, if you just want a solid thumbs up or down, I'd say that if you wished there were more games out there that gave you the ability to pilot a mech without the need to grasp the intricacies of some game's hex grid tango, or to do the quadratic equation to figure out if you hit or not, then it's definitely worth taking a look at. Let's start with the good stuff. First and foremost, Big Stompy Robots is as far as you can get from boring. 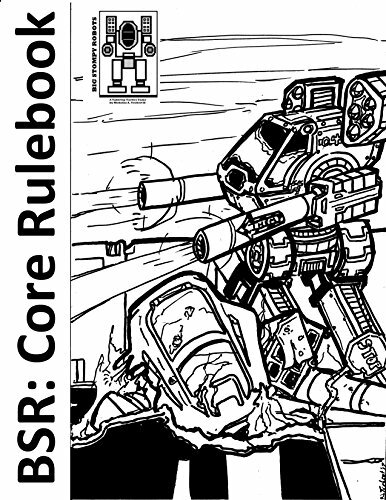 While it might have mechs as the centerpiece of the cover art and game mechanic, there's plenty of other stuff going on here. From alien species that feel like something out of an upbeat anime, to megacorporations battling over resources on a faraway planet, to an aesthetic best described as the love child of Tank Girl and Mechwarrior, this game is a lot of things, but boring isn't one of them. In addition to the scattershot tone that remembers sci-fi with giant robots in it is allowed to be fun, the rules of the game are fairly simple to learn. And if you've ever played a minis game before, then this one shouldn't take you long to pick-up. It's also fairly easy to teach to a new player, meaning you'll never lack for an opponent as long as you have an afternoon to go through a few test rounds. There are some downsides to this game, but they may be more or less important to you depending on your preferences as a gamer. If you plan to use it strictly as a minis game, one team of mercs versus another, then it gives you just enough story to use as a backdrop. If you're the sort of player who wants to make an RPG experience out of this, though, there really isn't enough material (or enough detail) to put together a fully-fleshed setting and campaign. That's to be expected, since this is the first book. However, the designer has said that if there is a demand for more that he has setting details and expansions in the works so that players can have all the factions, history, and plot hooks they could possibly want. Additionally, since this game is as indie as you can get, there isn't an accompanying line of specific miniatures to go with this game. Not yet, at least. If you have mechs from other systems, or even minis like Heroclix, those will certainly do the job as placeholders... but miniature gamers may wish they had the right tool for the right job, so to speak. Not going to lie, this game's independent nature certainly shows through. The art is all hand-drawn by the creator, and while the book is definitely legible and comprehensible it has its share of spelling and grammar mistakes that will jump out at you. None of them obscure the rules or setting, however, in much the same way a hole in the plaster doesn't make your apartment any less livable. But you're going to notice, so you should be aware that it's there before you get too ahead of yourself. Aside from the lack of polish (there's only so much you can do when you're a one-man operation trying to wrestle Amazon's portal into submission), the game is nice and simple. So if you like garage-band games that have the potential to expand, while still giving you something fun to play right now, go give Big Stompy Robots a look. Especially if you're sick of how seriously games like Mechwarrior take themselves, as if the grimness of the game and setting somehow balances out the addition of, well, big goddamn robots. That's all for this week's Moon Pope Monday update! If you'd like to see more work from yours truly when you're done giving this game the one-over, then go check out my Gamers and Vocal archives, as well as the YouTube channel Dungeon Keeper Radio. Lastly, if you're looking to get your hands on a new book, why not head over to My Amazon Author Page where you could find stuff like my sword and sorcery novel Crier's Knife? If you want to stay on top of all my latest releases and signal boosts, then follow me on Facebook, Tumblr, and Twitter. And, lastly, if you'd like to help support my work, then consider Buying Me A Ko-Fi as a one-time tip, or going to The Literary Mercenary's Patreon page to become a patron. Every little bit seriously helps!